Where shall I lay my eggs today? The usual nesting choices. 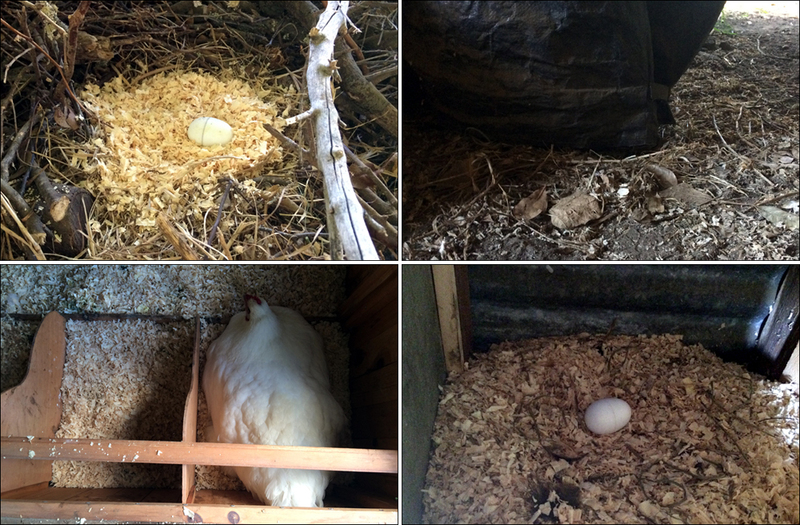 Top left: The new nest in the kindling pile (preferred by Honey, and the older hens, i.e., Lottie, Lulu or Leila); Top right: Pompom’s choice is under the edge of the barbecue cover; Bottom left: Francesca, Pearl (in situ) and Hannah use the nesting boxes in the hen house. Bottom Right: Fatima always lays in a nest box in the barn. As much as I love our hens dearly, sometimes they can be very annoying. 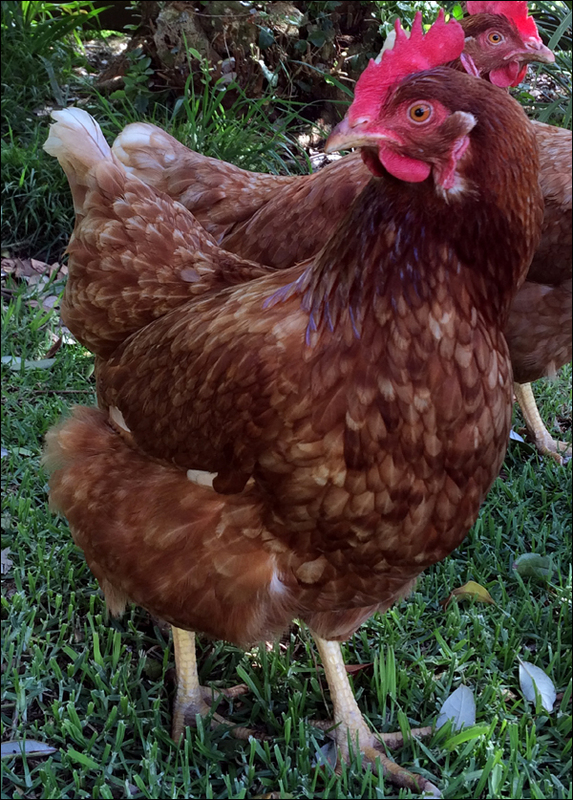 This particular tale concerns a couple of our ‘saved’ hens, Honey and Perky. In mid-September, Honey went missing for almost a week. Then on two mornings in a row, Ben spotted her eating pellets in the barn with the other hens – as if she’d never been away. Then she’d disappear again. 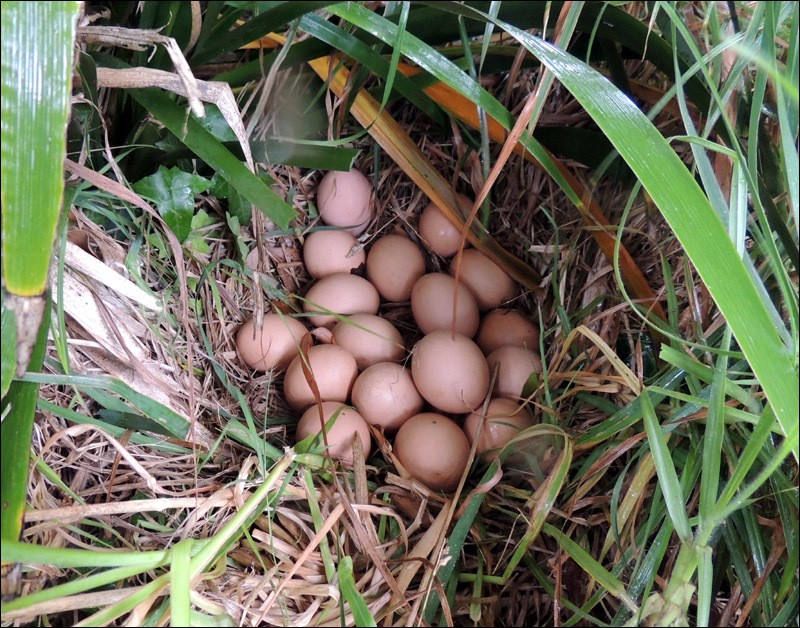 After some sleuth work (which involved spying and following), we found her in a grassy hollow in the back paddock, sitting on a mountain of warm eggs. She’d been sneaking back to eat at intervals, then returning to the (impossible) task of waiting for the eggs to hatch. Honey has stayed around since then, and has built a new nest in amongst the pile of dry kindling in the barn. And for a time, Perky, and our older hens started laying there as well. So there were generally 3 or 4 eggs in that particular nest when I’d check them each day. Hens don’t usually lay an egg on every day of the week, so when the number of eggs in that nest dropped down to 2 or 3 on most days, I didn’t think too much of it. 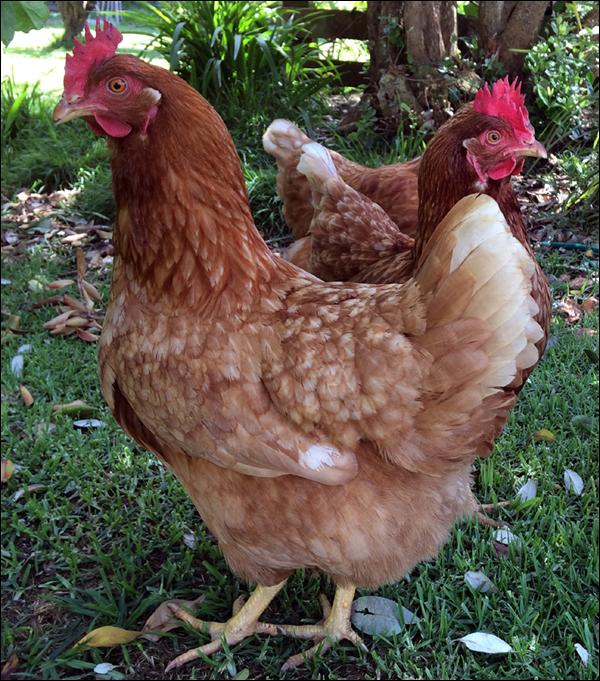 Missing eggs + Perky behaving suspiciously in the back paddock = one conclusion. Last night, Ben shut the gate to the hen enclosure and let the girls out early this morning so that he could see if any of them ran off somewhere. Believe it or not, there are 19 eggs in this pile! Sure enough, Perky headed out (the long way) to the back paddock and settled herself down amongst the long grass. Ben found one egg all by itself nearby and left her there to finish laying. When he went back an hour or so later, he found a nest with an additional 19 eggs! Not again! So he brought all the eggs inside and left a fake egg in their place. At least we know to look there now, and at least Perky hasn’t shown any signs of broodiness. It seems she’s been content to lay an egg on that huge pile, then join her sisters for the rest of the day. 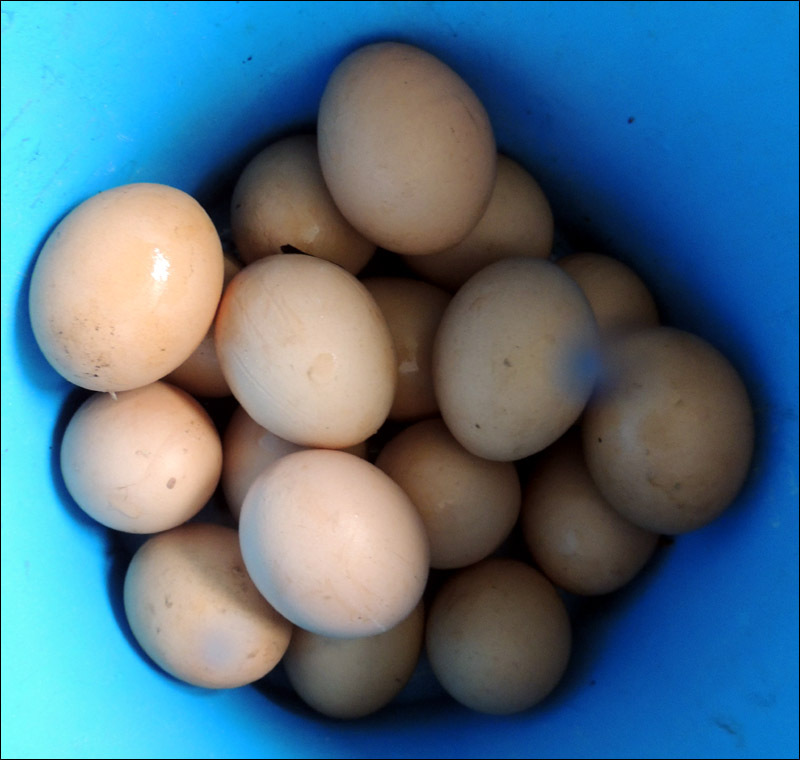 I’m going to check the 20 eggs for freshness, and I may end up discarding a few of them, just to be on the safe side. And if I do… well, that will be the annoying part. The waste of all those beautiful big eggs. Molly is generally oblivious to the goings-on of the hens. broody henbrown eggschickenscluckyegg mountainsEggsgardenhensHoneylivestocknesting boxesnestsPerkySouth Headwhere shall I lay my eggs today?